With two nominations at the UK Country Radio Awards 2008 behind her for Song Of The Year and Album Of The Year, Chilli Gold is not only a superb singer but is also an adept songwriter. Out Of My Mind is the lead-off single to her new album, Waterfalls (released 12 January, 2009)  a big, piano-led song that is sung, says the publicity machine, with a vocal that leaves no-one in any doubt that when Chilli sings a song, it stays sung! Such is the optimism surrounding this vital young lady that Waterfalls is set to establish Chilli as a major new talent. This year (March) sees her heading out on tour alongside Stella Parton, Billie Jo Spears and Linda Gail Lewis where she cannot fail to gain recognition as a consummate performer. With such positive promise, Chilli should soon be heating up the music scene with her compulsive brand of country-infused songs that conjure up explorations of a world unknown. 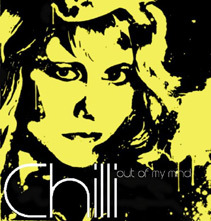  Chilli Gold's compulsive new single Out Of My Mind is out now, released on 8 December (2008) on Pebble Beach Records. Her album, Waterfalls, is released on 12 January (2009).